Researchers at the Max Planck Institute show that a molecule consisting of three adjoined sugars induces an immune response against Streptococcus pneumoniae. It may not take much to vaccinate against a particularly dangerous pathogen that causes pneumonia. 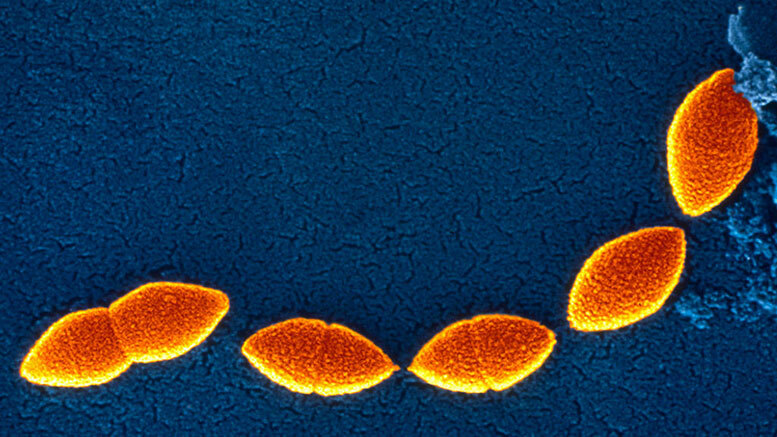 A molecule consisting of three adjoined sugars is sufficient to protect against infections with highly virulent and antibiotic-resistant streptococci. The trimer stimulates the immune system to form antibodies against the bacterium Streptococcus pneumoniae of serotype 8, short ST8, as researchers of the Max Planck Institute for Colloids and Interfaces in Potsdam demonstrated by in vivo tests. They illustrate how a new generation of tailor-made vaccines of can be developed. For many years scientists have used the characteristic sugar molecules on the surface of bacteria as a component of vaccines. However, immunization with mixtures of isolated capsular polysaccharides does not always reliably protect against infections with the actual pathogen. The mixtures are not effective against all subtypes of the bacteria. Moreover, their production is expensive and expensive, since the surface sugar is often contaminated with other sugar molecules. An alternative is provided by synthetic sugar molecules, which resemble the surface molecules of the bacteria. Coupled with carrier proteins, these molecules are effective vaccines that are much simpler to prepare in the laboratory than the isolation of conventional vaccines from bacteria. However, the researchers need to know exactly which component of the bacterial envelope actually induces immunity to the pathogen. The identification of this component can be tedious, and complicates the development of this new generation of synthetic vaccines. In order to keep the synthesis effort for the vaccine manageable, the researchers identified the smallest possible sugar for immunization. For this purpose, an automated synthesis method developed by Peter Seeberger and his colleagues was used to produce a series of different sugar molecules that correspond to different parts of the capsular saccharide on the ST8 bacterium. They then tested which sugar molecules are recognized by antibodies that are also active against ST8. These molecules were found to also trigger a protective action against the pathogen in vivo. Animals that received a particular sugar combination produced antibodies that were effective against the genuine capsule polysaccharides isolated from ST8 bacteria. Mice that had been given a different combination also formed non-protective antibodies. In order to find out which part of the capsular saccharide induces effective antibodies, the researchers analysed the binding behavior of the antibodies more precisely. They ultimately showed that a triple sugar containing two glucose and one galactose molecule mediates the protective immune response. Addition of the synthetic sugar molecule to the current pneumococcal vaccine Prevnar 13, expanded the protection in vaccinated animals from 13 to 14 serotypes including the dangerous ST8 pathogen. Currently, the researchers aim to develop a vaccine for humans together with Vaxxilon AG, a Max Planck Institute spin-off company. The MPI team has a long track record developing synthetic vaccines based on sugars. “Synthetic carbohydrate vaccines represent a paradigm shift within vaccine research,” says Seeberger. “They are more precise, effective and easier to manufacture than conventional vaccines.” The synthesis of the ST8-effective sugar molecule is a further milestone on the way to a new generation of tailor-made vaccines. Be the first to comment on "Triple Sugar Molecule Protects Against the Pneumococcal Strain ST8"